Cooking together can be great foreplay. Add in the aphrodisiacs in this Cinnamon Rubbed Pomegranate Chicken Thighs and you have a winning combination for sparking romance! Sometimes when date night rolls around, it feels like one person ends up doing all the cooking, while the other sits around being pampered. While there are definitely occasions for that kind of night, this Cinnamon Rubbed Pomegranate Chicken Thighs is easy to cook together. Like a dance in the kitchen. One person does the chopping while the other does the cooking. This meal is cooked in intervals that allows you to easily swap ownership based on skills. It also keeps dishes to a minimum so you can spend your evening together, not slaving over the sink. 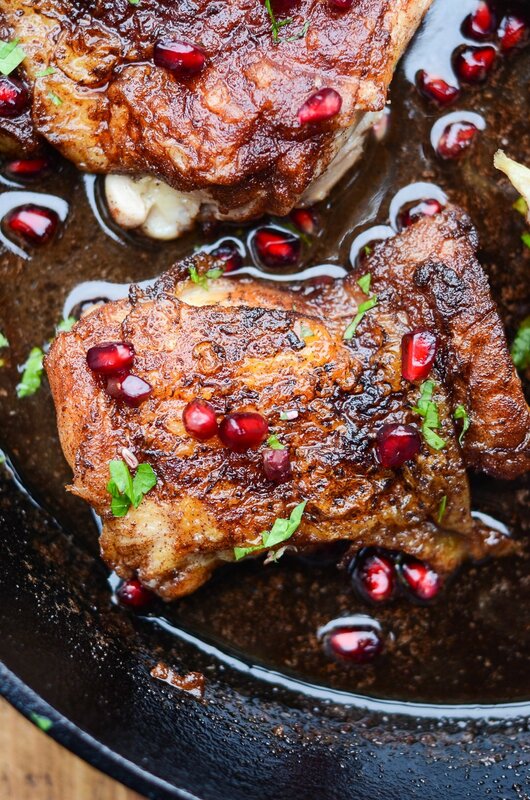 These Cinnamon Rubbed Pomegranate Chicken Thighs are made with a few different aphrodisiacs. Each one works in different ways. Pomegranate. The pomegranate works by lowering cortisol levels, which corresponds with increased testosterone levels. As a result, this leads to better moods and increased sexual desire in both men and women. Interesting fact: some people believe that the forbidden fruit from Genesis was actually a pomegranate, not an apple. Honey. Honey naturally has nitric acid in it, which helps with helps with blood flow during arousal. This one is great for both men and women. Nutmeg. Known to help lower inhibitions and raise body heat, this spice can also help boost libido and potency. It’s also been used to sweeten breath. Make this Cinnamon Rubbed Pomegranate Chicken Thighs exceed your expectations by brushing up on these culinary skills. Pan-Frying 101. Get my tips for how to get the perfect golden brown skin on your chicken. What Are Aphrodisiacs and How Do They Work? Find out how aphrodisiacs work and how to use them to your advantage. How To Buy and Store Spices. Make sure that your spices have maximum potency by mastering freshness. If you want to make the aphrodisiacs last a little longer, you can easily double the recipe. If you have leftovers, they will keep up to 5 days in the refrigerator stored in an airtight container. To keep the chicken skin from getting soggy in the fridge, make sure they are completely cooled before packaging them. Also, I recommend keeping the sauce separate (just a recommendation though, not necessary) so the chicken doesn’t become overly pomegranate flavored. Add a little bit of chicken stock into the bottom of the pan and add in the chicken thighs. Place in the oven and bake for 20 minutes, or until heated throughout. Reheat the sauce in a small pot on the cooktop until it simmers. Spoon over chicken and serve. 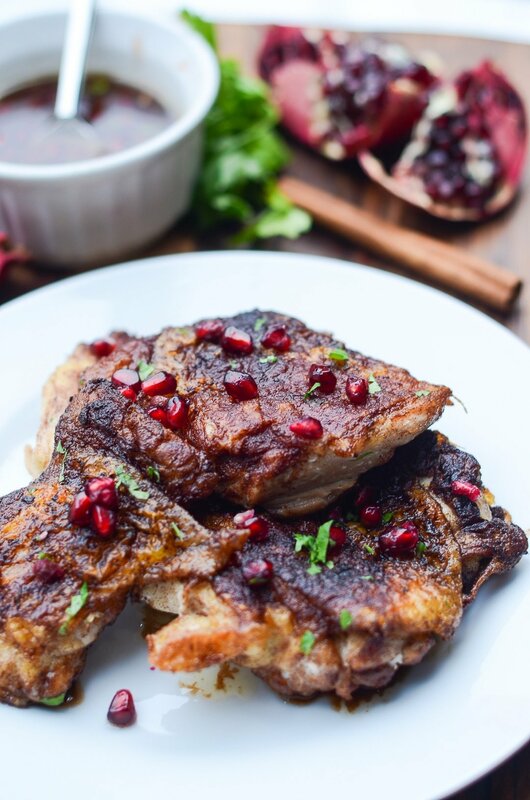 Get your free printable grocery list for this Cinnamon Rubbed Pomegranate Chicken Thighs HERE. This grocery list has everything that you’ll need to make this Cinnamon Rubbed Pomegranate Chicken recipe. To make grocery shopping simple, each ingredient is listed in easy-to-find grocery store amounts. If there is no amount specified, that means that you can buy the smallest (or largest) container available and still have plenty left over. In a small bowl, combine the cinnamon, nutmeg, garlic powder, and onion powder. Rub the outside of the chicken thighs thoroughly with the mix. 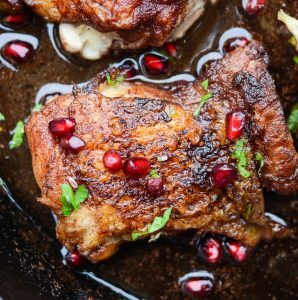 While the chicken thighs cooks, stir together the pomegranate molasses, honey, and pomegranate juice. Remove the chicken thighs from the pan and set them on a plate to rest. Pour the sauce mixture into the pan and reduce it by half. Scrape up any cooked on bits of chicken from the bottom of the pan. Return the chicken thighs (skin side up) to the pan and cook for 1 minute. Stir in the reserved pomegranate arils and serve. If you remove the thigh bone prior to cooking, cooking times will be more approximate. If you choose to leave the bone in, cooking times can vary on each side by up to five minutes. I love this! #sexyeats I have Oysters with a Bacon, Blood Orange, and Jalapeno Mignonette that might qualify 😉 I love anything with pomegranates, and your pomegranate chicken thighs look perfect for Valentine’s Day or any day! Im not sure ive ever thought of pommegranates as an aphrodisiac but these sure were addicting! ! I love dishes that are made with simple ingredients but pack a ton of different flavors– Ill definitely make this again! These chicken thighs sound amazing!! I can’t wait to try them – and to have my hubby help! 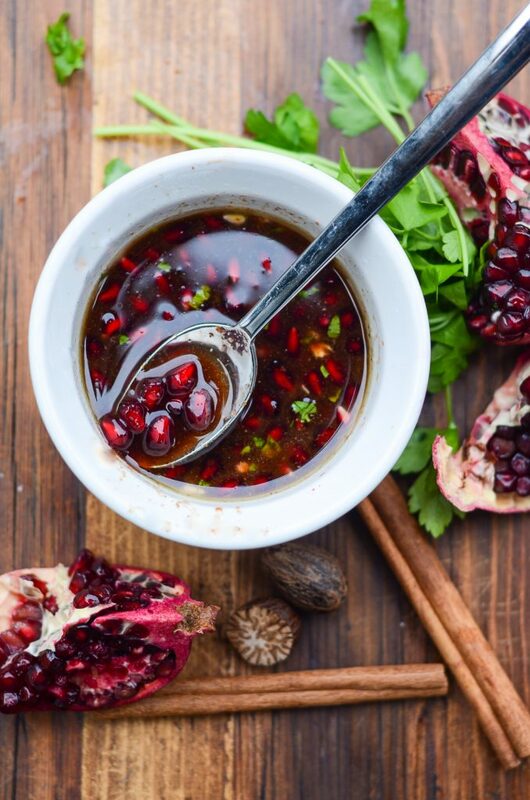 I’ve never heard of pomegranate molasses but this looks like a fun dish. Love the cinnamon rub! I love using cinnamon in savory recipes! It’s such an underutilized spice in savory dishes! Also, you can usually find pomegranate molasses around the Salad Dressings depending on the grocer. The chicken thighs look absolutely scrumptious. Such beautiful colors with the deep red pomegranate sauce. That cinnamon and nutmeg in the seasoning reminds me of Chinese Five Spice. Yum!! It totally does, Marisa! I hadn’t even thought of it being like Chinese Five Spice! I love getting to use spices like cinnamon and nutmeg in savory dishes! Chicken thighs are my favorite cut of the chicken! Pomegranate molasses?! I have never heard of that! Sounds amazing. You can usually find it around the Salad Dressings or in a Middle Eastern section, depending on the grocer. sounds tasty! A Valentines’ Day meal, perhaps? It would make a perfect Valentine’s day meal…or anniversary! This sounds absolutely delicious! I love pomegranate anything, so it’s a win in my book! I’m with you on the pomegranate anything front! Pomegranate season is always too short for me! This looks amazing! Your post is extremely detailed and I especially like the section on how the different ingredients work as aphrodisiacs. Thanks for posting this. Thank you, Saima! I find the topic of aphrodisiacs so interesting. I’m glad you enjoyed it! This looks so delish!!! I could so go for this for dinner! Adding this one to the menu soon!! This is such a bittersweet recipe for me! I absolutely love pomegranates and your chicken looks amazing but cinnamon and I don’t go well together… I’ll try it with a pinch of cinnamon so maybe it’ll still retain a bit of the magic.. Such a lovely recipe. And it looks amazing! What a colorful dish! I am sure it will taste every bit as good as it looks!